Sclerotinia stem rot is a yield-limiting disease of soybean, especially in the Upper Midwest Region of the USA, and Eastern Canada. This presentation covers characteristics of Sclerotinia sclerotiorum, the cause of Sclerotinia stem rot, that are relevant to understanding the management of this disease. 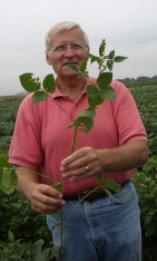 Sclerotinia stem rot is a disease of high yield potential soybeans. Most management practices intended to increase yield potential also increase the risk of yield loss associated with Sclerotinia stem rot. Management of Sclerotinia stem rot requires a coordination of soybean variety selection and adjustment to agronomic practices.